As my eyes glanced down at the last few words of Spelman’s Repair, I was left with a strange feeling. After reading the whole book, it was one line in the final chapter that changed my perception of the entire composition. The concept of the book is that, as humans, we are constantly striving to fix all the broken aspects of our lives: tangible objects, relationships, people, society, anything and everything. 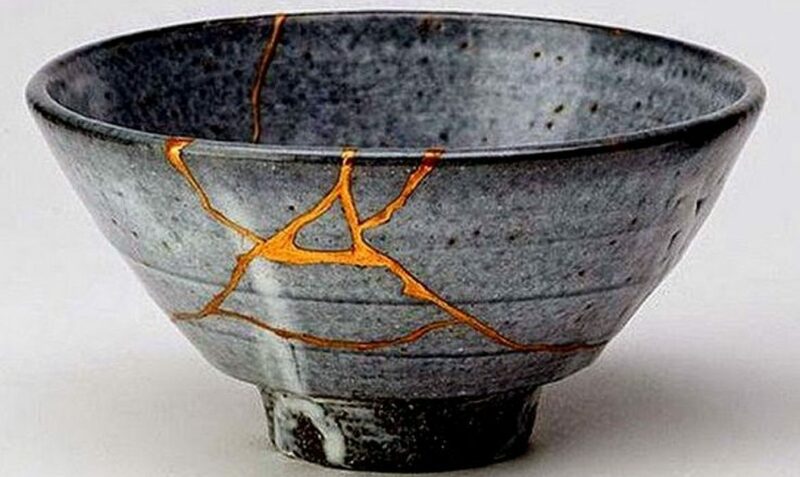 However, the act of repair itself is destructive, as “repair destroys brokenness.” (134) As we go about our lives trying to fix these broken pieces along the way, we are actually just refusing to let go. The concept of something that was once good in our lives–a new car, a friend, a possession–not being what it used to be breaks us if we hold on too tightly. I am guilty. I am guilty of everything Spelman writes about concerning repair as preserving continuity with the past. I seek sentimental value in many things in my life. Somehow, I manage to get emotionally attached to little things, whether they be objects or memories. A few months ago I was drinking tea out of a mug. It was not a fancy mug, but I had gotten it in Puerto Rico and it had an adorable orange crab on it. When I went to put the mug down, it was not fully on the counter surface and it fell. I watched it fall as if it were in slow motion, my heart beat a little out of my chest as I watched the mug shatter into many pieces. I was left with two options: throw away the pieces or save them and try to put them back together. I saved them. My first attempt to fix the mug was unsuccessful because I did not have the right type of glue; so to this day, the pieces of the mug sit in a little jar in my room for me to one day fix. The reality is, it is just a mug. In my kitchen I have tons of mugs: striped ones, greens ones, Hannah Montana ones, so there was no need for me to preserve this one. This was just a minor mishap in my life that happened until I read Repair. Spelman says, “Repair is about trying to preserve some kind of continuity with the past, with objects or relationships that already exist and have fallen prey to damage or decay.” (127) I reflected on this scenario and asked myself “Why?” Why did I save this mug and what was the sentimental attachment? I suppose it was because I got in on vacation or maybe the visual appeal with the crab. However, those are just excuses for me to try and put the pieces back together. In my mind I had made this object into something more than just a ceramic mold to drink out of. This mentality is one of the human faults as a Homo reparan. Everyone has heard, “Live in the moment, don’t look back in the past,” but this is sometimes easier said than done. Spelman writes, “…for while repair in one sense honors the past by paying homage to an earlier moment, in another sense it erases the past by undoing much of what in the meantime has happened.” (125) Sometimes we are so caught up trying to repair the broken aspects in our lives that we miss enjoying the desirable present things. As we let go of an old chapter to begin a new one, we spend much of our time dwelling on past memories as a result of that being such a wonderful time. Repairing our lives to go back to the way they once were prevents us from fully enjoying life. A way that I pay homage to earlier events in my life is by recording my daily life in a journal. Journals are ways of replication because people write as a way to alleviate their thoughts. Although we can never live the same moments twice, journals remind us of those moments and take us back to the past. Using writing as a tool to repair us on an emotional level allows us to stay in tune with the past and process any broken feelings. A form of repair that Spelman does not specifically address is closure. Although she mentions apologies which are similar, closure is more for personal benefit. Spelman teaches us that it is not just tangible items that need repair, but sometimes human relationships. Closure is a way of repairing broken emotions within oneself. By seeking closure, humans mend their hurt feelings in an attempt to move forward. If we do not repair by closure, we cannot repair the past. Often times, receiving closure gives us internal peace of mind and puts to rest that agonizing feeling of something not feeling right. My junior year of high I needed closure to repair my broken self. Although I had not broken a bone or anything physical, my heart felt more shattered than my crab mug. Internally I was so hurt by the action of another person that I could not have moved forward without settling these emotions. When Spelman talks about apologies to repair, she explains how two people must be involved for it to occur. No apology was going to fix how I felt, the only thing that could repair my feelings was to deal with it myself. No words, no matter how meaningful they were, would change what had happened. Closure is an important part of repairing because it is something that an individual needs to do for oneself. Another way we are tied to the past is through tragedies. Tragedies stir up all different emotions from anger, to sadness, to disappointment. The emotions stick with us and are hard to get rid of because of the capacity of the event. Throughout Repair Spelman mentions the Holocaust and 9/11. Despite the fact that the Holocaust happened many years ago, it is frequently a topic of discussion. Why do we still choose to talk about an event in the past that not only broke but destroyed thousands of people and families? We are connected with this past event because those negative emotions have to be passed down to pay homage to the victims. 9/11 was a tragedy that happened in my lifetime. I live fifteen minutes from New York City and have a 9/11 memorial spot in my town. A destroyed piece of one of the twin towers sits right outside of my highschool by the door. Everyday as students walk in, they are constantly reminded of this awful thing that happened or they can choose to ignore it. Either way, it does not change the fact that fifteen years ago, all those lives were taken. Reality is, we cannot just move on from the things in the past that hurt. They will always impact our lives even if it is in ways we do not realize. Somethings just cannot be repaired. Even when repair is attempted, it is still never the same from the original. Repairing the broken aspects in our lives prevents us from moving on. Whether we preserve objects that we can simply replaces or are hanging on to overly nostalgic emotions, humans constantly are trying to reach a state of perfection. However, this perfection is unobtainable because every aspect of life eventually deteriorates. As my eyes glanced down at the last few words of Spelman’s Repair, I was left with a strange feeling. After reading the whole book, it was one line in the final chapter that changed my perception of the entire composition. The concept of the book is that as humans, we are constantly striving to fix all the broken aspects of our lives: tangible objects, relationships, people, society, anything and everything. However, the act of repair itself is destructive, as “repair destroys brokenness.” (134) As we go about our lives trying to fix these broken pieces along the way, we are actually just refusing to let go. The concept of something that was once good in our lives–a new car, a friend, a possession–not being what it used to be breaks us if we hold on too tightly. I am guilty. I am guilty of everything Spelman writes about concerning repair as preserving continuity with the past. I seek sentimental value in many things in my life. Somehow, I manage to get emotionally attached to little things, whether they be objects or memories. A few months ago I was drinking tea out of a mug. It was not a fancy mug, but I had gotten it in Puerto Rico and it had an adorable orange crab on it. When I went to put the mug down, it was not fully on the counter surface and it fell. I watched it fall as if it were in slow motion, my heart beat a little out of my chest as I watched the mug shatter into many pieces. I was left with two options: throw away the pieces or save them and try to put them back together. I saved them. My first attempt to fix the mug was unsuccessful because I did not have the right type of glue. So to this day, the pieces of the mug sit in a little jar in my room for me to one day fix. The reality is, it is just a mug. In my kitchen I have tons of mugs: striped ones, greens ones, Hannah Montana ones, so there was no need for me to preserve this one. Everyone has heard, “Live in the moment, don’t look back in the past,” but this is sometimes easier said than done. Spelman writes, “…for while repair in one sense honors the past by paying homage to an earlier moment, in another sense it erases the past by undoing much of what in the meantime has happened.” (125) Sometimes we are so caught up trying to repair the broken aspects in our lives that we miss enjoying the desirable present things. As we let go of an old chapter to begin a new one in our lives, we spend much of our time dwelling on the past memories as a result of that being such a wonderful time. Repairing our lives to go back to the way they once were prevents us from fully enjoying life. Repairing the broken aspects in our lives prevents us from moving on. Whether we preserve objects that we can simply replaces or are hanging on to overly nostalgic emotions, humans constantly are trying to reach a state of perfection. However, this perfection is unobtainable because every aspect of life eventually deteriorates. Everyone can relate to that feeling of being a small child and having to say, “I’m sorry.” They can relate to that embarrassing, gut-wrenching feeling of having to force the words out because a parent or adult tells them to. For some reason, apologizing at a young age is extremely difficult and feels shameful. However, as we become older, we utter those two words subconsciously. We say “I’m sorry,” many times throughout the week, whether we bump into someone or accidentally perform some act of human fault. However, those truly are accidents. The apology that Spelman talks about in Repair is not that phrase. It is a deep sincere extension from one person to another that leaves the person apologizing at risk of rejection. Once the apology is expressed, it needs forgiveness in return by the person who is hurt. “An apology is an invitation to share in the ritual of repair, in a dance that takes more than one dancer.” (Spelman 85) Apologies help save many friendships or relationships that are about to be torn apart. They serve as bandaids to pull together the two people until the issue is resolved and the feelings are no longer hurt. I remember the first time I really processed what it meant to give a genuine apology. I was sitting on the back of the bus in fifth grade. My friend, Grace Harrison, was sitting next to me lecturing me on how to give a sincere apology and not just the standard, “I’m sorry.” She explained to me how when a person apologizes, they cannot justify their actions, there is no “but” or “I was just trying to.” The person must take full ownership of their actions and admit that they are wrong. When Spelman’s said “…but strips away any suggestion that there are extenuating circumstances that could relieve one of blame; it must be clear that he regrets what he has done and feels sorrow…” (82-83), I instantly thought of Grace. On the other side of apology is reparation. It is still an attempt to fix broken feelings, but involves less raw emotion. Usually reparation is implemented when the action is too large for an apology and not worth extending forgiveness. Because there is no “I’m sorry,” there is no need for the person hurt to forgive. Any historical event with mass murder or forms of torture can never be repaired by an apology. Nothing can even come close to making those actions acceptable, but reparation occurs as a gesture to try and make it better. For example, everyone knows that the Holocaust was one of the most tragic events in history. Families were ripped apart and thousands were murdered. Nothing can ever change or take back what happened to those families. It was a horrific event that no apology could fix. There is no way to say, “I am truly sorry that your family members suffered and were killed.” No one should have to accept that apology either and say, “I forgive you,” because those acts cannot be forgiven. Whether it be an apology or reparation, both serve as a cushion in society to try to make better actions that were wrong. Although they have different circumstances for which they apply, they help repair the people who are emotionally hurting in society. Imagine a female. Imagine her on a calendar in a swimsuit hanging in an auto mechanic shop. Her purpose being something nice to look at throughout a tough work day. Now imagine another female. Imagine her fully clothed in a mechanic coverall, wrench in hand. Her job is to go to work, efficiently completing her tasks at hand using physical tools. Both are women, both in the mechanic shop, however the woman working is refusing to accept the societal stereotype that she does not have the skills to work there. There is a stigma in society around women and their ability to do a job working with their hands, getting dirty, and repairing parts. In Repair by Elizabeth Spelman, she discusses the division of different labors due to gender. Spelman mentions how the presence of a female may make men resentful because they will have to remove their objectifying posters and watch their words in her presence. Men should not feel as though they are entitled to jobs with grueling labor, especially when females have the same capability to do them. “In both new and used bookshops it’s not hard to find home repair guides addressed specifically to women. It’s not unusual for them to begin with a bit of a pep talk” (Spelman 27-28). These introductions are derogatory and offensive because it automatically assumes that women need this motivation to conquer the task solely because of their gender. It further perpetuates stereotypes that men should know how to use tools just by default which is not always the case. The larger issue is that society creates a divide between genders that influence the way people perceive a woman’s physical strength and capability. For example, lifting weights. Working out is an activity to stay healthy that both men and women should partake in. However, if a person goes to a gym they might realize that there are primarily men in the weightroom. When I walk into the weightroom at they gym and only men are in the room, it can seem incredibly intimidation. I instantly feel more aware of my presence in the room and sometimes feel unwanted. Even though no words are usually exchanged there is a different dynamic when I walk into the room. I notice the men glancing or judging me, making me feel ostracized even though we are all there for the same reason. One time an older man walked up to me and said “C’mon you can squat more weight than that!” when the reality of the situation was that I had hurt my back squatting more weight last time. I was extremely uncomfortable and felt like he made that comment assuming I was taking it easy because I am a girl. The idea that females are not strong or should not be muscular is effective in society. This creates a further issue in life of how a woman and man should look. It is embedded that a women should be fragile and dainty and a man should be built and tough. These appearance correspond with Spelman’s concepts about women and physical tools. It is necessary that society repair and revise the ideology that women are not equally adept at strenuous activities as men. If we eliminate the concept that men and women are held to different standards, then we can redesign people’s automatic associations with gender roles. This is a long long long extra – quotation from Spelman’s book Repair.